After a long wait, season 1 of our first-ever podcast, Freelance to Founder is finally here. You can listen to all 8 episodes of season 1 here or by searching “Freelance to Founder” in iTunes or wherever you listen to podcasts. Season one tells the story of 8 freelancers & solopreneurs who scaled their businesses to be much bigger than themselves. Bianca Board from Foxley—a freelance designer who built an agency making millions in revenue. CJ Burton— a college grad who waltzed right into the Time Magazine offices to pitch his work—and got the job. Now he works with ESPN, Oprah, the Wall Street Journal and more. Jeff Sheldon from Ugmonk—a freelancer who pivoted to build one of the most respected design/fashion brands on the web. Courtney Brown from Cents of Style—a stay-at-home mom who launched a business that has since brought in millions of dollars in revenue & allows her to employ other moms raising families. To listen to the full season, click here. 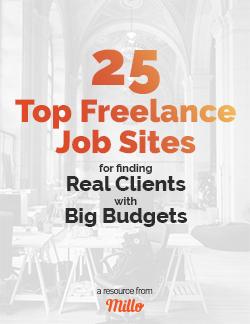 Freelance to Founder is hosted by my very talented friend, Dallan Wright. He’s over-the-top skilled on the microphone and has done an amazing job producing these shows. I couldn’t have done it without him. Season one is also sponsored by a company that started with just one employee and has grown to serve thousands of customers. Sponsors like Freshbooks allow us to create high quality free content like this show here at Millo. And you can try Freshbooks free for 30 days by clicking here and entering “FTF” in the “how did you hear about us?” section. I am always proud of the content we put out here at Millo, but this podcast is all-new-level kind of stuff folks. I’d be honored if you can have a listen, offer an honest rating on iTunes, and share it with your friends. Enough talking… enjoy our brand new podcast, Freelance to Founder.